You are here: Blog › What's new in Mailchimp for WordPress "The Big Three-O"
What's new in Mailchimp for WordPress "The Big Three-O"
We recently announced that we're a few weeks out from releasing Mailchimp for WordPress version 3.0, in which we will be "breaking" backwards compatibility. We're now confident that we will be able to release this new version on Monday, November 23. Just a little over a week from now! So, how are we using this opportunity to introduce certain much anticipated new features or other changes? Well, here's a sneak preview of things to come! When we first released the plugin back in 2013, one of the key features was that you had direct access to the HTML of the actual form fields. This is very cool if you're familiar with HTML, but it can make the task of editing your form fields a little daunting for some. While we did have a "Field Wizard" to help you generate the correct HTML, it was pretty limited to be honest. Especially when you compare it to the revamped form editor we're about to show you. We took everything we learned in the last 3 years, threw away all existing Form Editor code, removed the default QuickTags editor and built a new one from the ground-up. Over the years, more and more settings were added to the form settings screen resulting in a bit of a mess. We took the opportunity to group related settings together and move less important settings out of view, resulting in a much better experience for the eyes. We built a powerful API for integrations, allowing third-party developers to add a Mailchimp sign-up option to their forms in just a few lines of code. 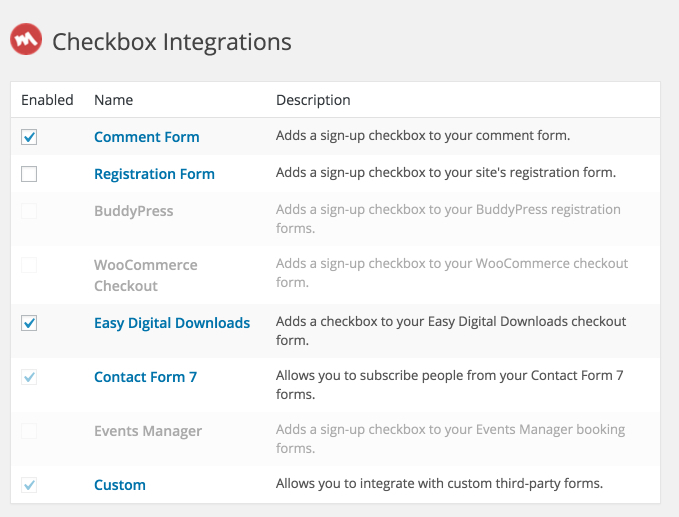 All integrations now get their own settings screen, allowing for more fine-grained control & integration specific settings. 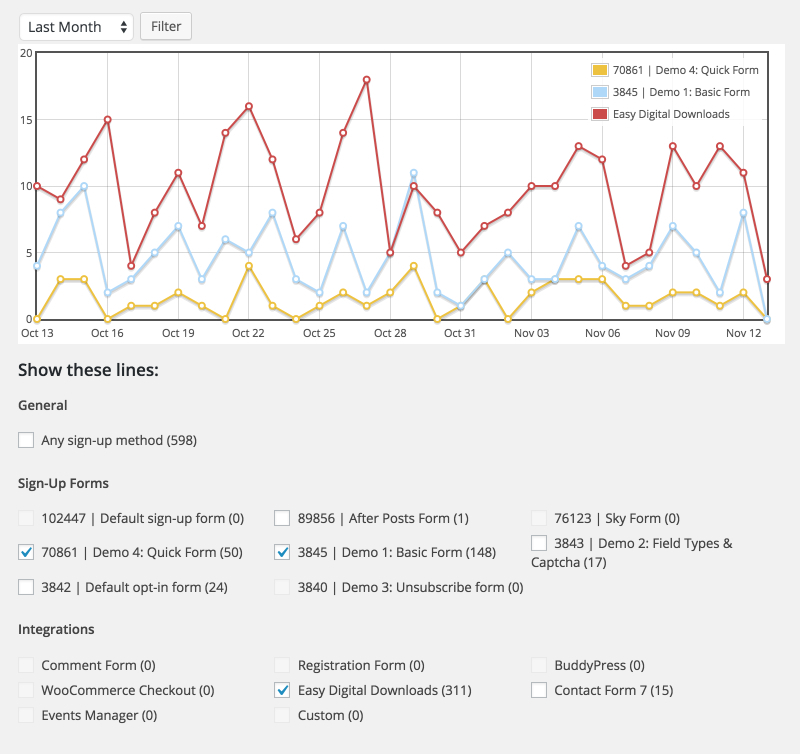 When using our premium plugin, all sign-up requests are logged & plotted in a line graph. Where this graph used to be mainly about totals or just built-in sign-up forms, version 3.0 makes it easy to compare performance of your sign-up forms and other integrations. A few weeks ago, we vastly improved the performance of our knowledge base search. We're taking this one step further by offering you a quick search option right from where you need it: in the plugin itself. While we are more than excited about all of the above changes, perhaps the biggest improvements in "The Big Three-O" aren't that visible. We went through all available filter & action hooks, fixed all inconsistencies & added documentation for every single available hook. A self-updating code reference is now available for developers. A ton of meaningful unit tests have been added using PHPUnit & BrainMonkey. Client-side event binding is now as simple as writing mc4wp.forms.on('subscribe', ..). The two codebases of Lite & Pro have been merged together, where Pro is now a bundle of add-ons depending on Lite (now "Core"). While there are even more changes worth discussing, we're going to leave it at the above for now. In a little over a week, you get to see for yourself what we're so excited about.